Have you got a website or web application that you need help building? We are a specialist web development company that has a great deal of experience in helping creative and marketing agencies turn their designs into code. Whether you need help with front-end or back-end development we can fulfil your requirements. We are capable of stepping into a project at any stage. Whether you need developers from the word go, or just need help in the final stages. We are a noded team of developers who all follow the same high development standards and understand the importance of staying on top of our game. 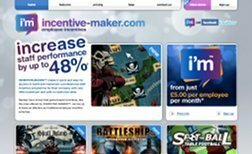 Incentive-Maker™ makes it quick and easy for anyone to build and implement a professional staff incentive programme for their company with very little investment and with no technical skills.